"You'll have to speak up, I'm wearing glasses"
Gosh, it's all been a bit quiet on the gaming front this week, hasn't it? Like, nothing much has happened at all. Except that little thing called Gamescom. And the PS4 getting a release date. And the GTA 5 soundtrack leaking out. And the Xbox One striking back big time. And the PS Vita getting resurrected. Yes, Gamescom was the big one this week, and the Cologne show kicked off with Microsoft's Xbox One event, which was actually a pretty intimate affair. That's not to say it didn't go big on the announcements. No sir. Confirming rumours, Microsoft revealed that all European pre-orders of the Xbox One will come with a free digital download of FIFA 14. It was a strong message to send out - this console is still very much about the games. Then we got a full explanation of the Xbox One's plans for indie developers. It's offering up a service called ID@Xbox that will let devs go big on the platform, offer them two free dev kits, and charge zero administration fees. We were also given a definitive list of all the Xbox One titles that will be launching with the console. Maths fans will note that there are 23 games making up the collection, which right now is more than the PS4. According to Microsoft's corporate VP Phil Harrison, this is the strongest lineup of games in the history of consoles in the history of EVER. No need to be so humble, Phil. Then it was Sony's moment to strike. The big news here was the release date, with the PS4 now officially set to hit the US on November 15 and the UK on November 29. Microsoft hasn't given us a solid figure for when the Xbox One will appear – could it still slip in ahead of Sony? Time's a-ticking. 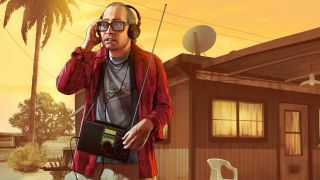 Just a few hours ago, between 20 and 30 hours of audio from GTA 5 was reportedly leaked online. The source was the game's pre-install files that several keen beans managed to crack into. As we were writing this, the list was only part way through completion. But so far, assuming this is the real McCoy, it's looking to be one of the strongest GTA soundtracks of all time. As for the names of the radio stations themselves? So far it's reported that we'll be able to choose from Radio Los Santos, Soulwax FM, West Coast Classics, Rebel Radio, San Juan Sounds, and plenty others too. We know there has to be more to come. For one thing, French electronica artist Kavinsky is believed to be featuring heavily on the radio and currently rumoured to have his own station. Yes, we can now all pretend we're in Drive. Scorpion jacket and hammer not mandatory. Sony may have just pulled a George Romero and brought the PS Vita back to life. During Gamescom this week it took a moment to announce that the handheld is getting a healthy price drop down to $199/€199, while UK retailers seem to be going for around the £150 mark. And to make that even sweeter, it was confirmed that both the Vita and PS4 will be getting a shedload of indie titles in the coming months, including Binding of Isaac and Hotline Miami 2: Wrong Number. There was also confirmation that we'll be able to use the Vita for remote play on almost every PS4 game. The Vita has had it rough, but by making its handheld the new home of indie gaming Sony could have a winner on its hands. With all the console hype going on, we thought it would be the perfect time to learn how to make a next-gen game for the PS4 and Xbox One. Turns out it's REALLY hard. So we gave up. But it's also really interesting, and we tapped into the minds of developers behind Ryse, FIFA 14, Forza 5 and Need for Speed Rivals to steal their secrets. We're big fans of Rare here at TechRadar, so we were intrigued by an interview with Creative Director Simon Woodroffe by the team at Official Xbox Magazine. Woodroffe said that Rare has an idea for a new Perfect Dark that would incorporate Kinect, and apparently "a lot of people" in the team also want to do something with Banjo too. And on that exciting note we'll finish up with some links from around the Future web. Oh, and Gabe Newell, if you're reading this (as we suspect you are) how do you fancy being the new Microsoft CEO? All we're saying is - just think about it. Ryse Xbox One hands-on - Has Crytek made up for E3's button prompt overdose?